I hope Louie is tending to the chores or at work or doing whatever he is supposed to. Otherwise dinner is going to be pretty slim. Mrs. Louie is clearly in charge. Wow! With that much disapproval from just one eye, I tremble to think of the effect of Mrs. Louie's full frontal disapproval! Mrs. Louie is such a beautiful, and distinguished rabbit! I wanna kiss that bunneh-forehead, and stroke her ears! I do not think I would enjoy being Disapproved Of by her, though! No way! I regret my blunt accusatoriness...there is no telling what, or alas, who I would have given up under Mrs. Louie's scorching gaze. 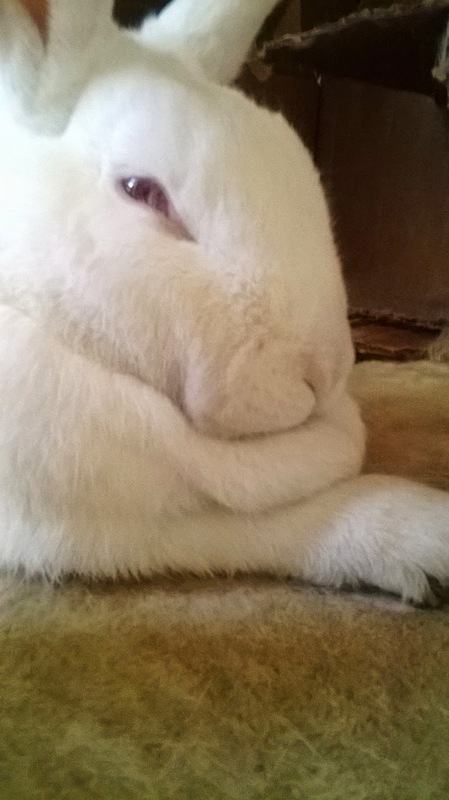 Shes a very sassy and funny bunny and i love her dearly..shes still not sure how she feels about all this "unwanted petting" yet. Shes also very possessive of "her stuff" and i have learned to time cleaning her litter box just right (when shes fast asleep) otherwise she comes over all "oh..watcha doin? cleaning my litter box huh? ...thats nice..*bats eyes all flirtatious like" and then the next thing you know its "SSSSSSSSS" all over the carpet not 2 inches from my toes. I wish that my extra chin fat were this attractive. Monica, all this effort is keeping you young. Ah, Monica, the beginning of wisdom: finally giving up? Actually, Sally, I think I would do better if I could switch out every one of my physical attributes with Mrs. Louie's' corresponding one. She ain't no Shrimp Louie! Sally, I actually do love the red eyes, and if I could lower my lids menacingly whenever I wanted the way Mrs. Louie does, who would know?